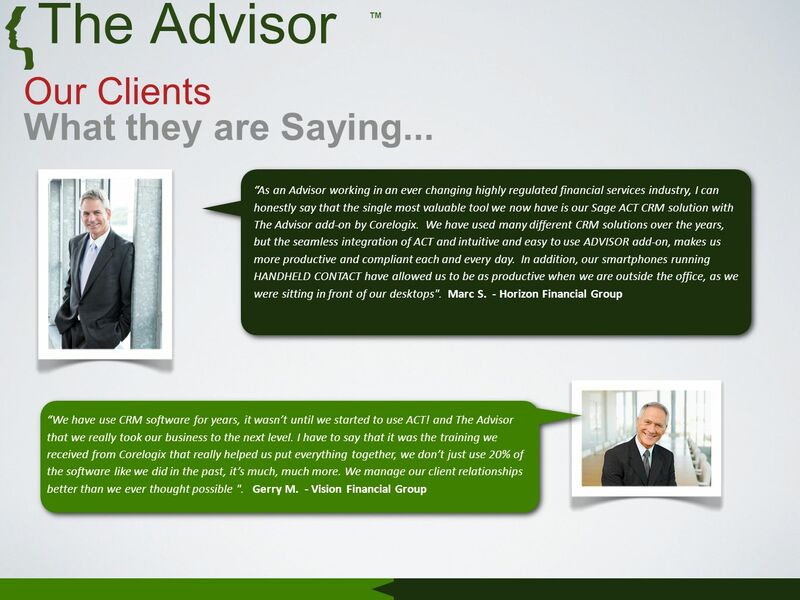 The Advisor Sage ACT! Add-ons for Financial Professionals. 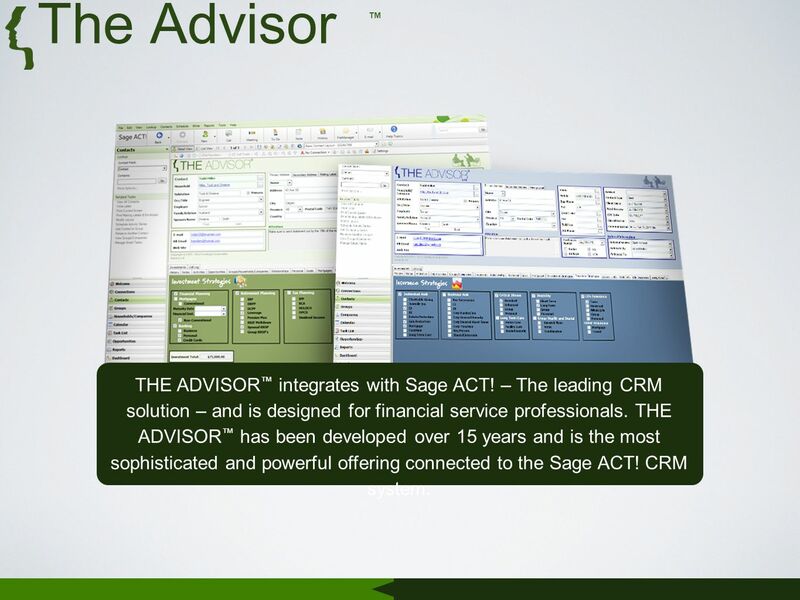 2 The Advisor THE ADVISOR integrates with Sage ACT! 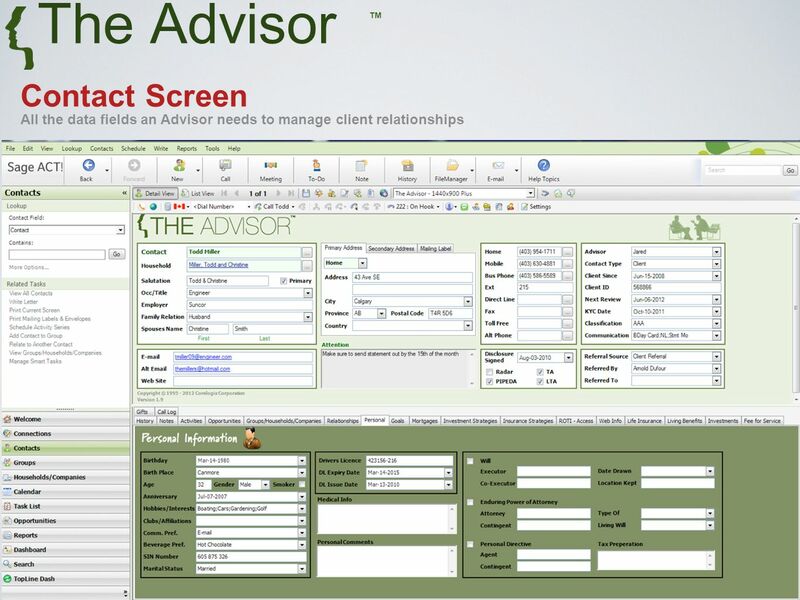 – The leading CRM solution – and is designed for financial service professionals. 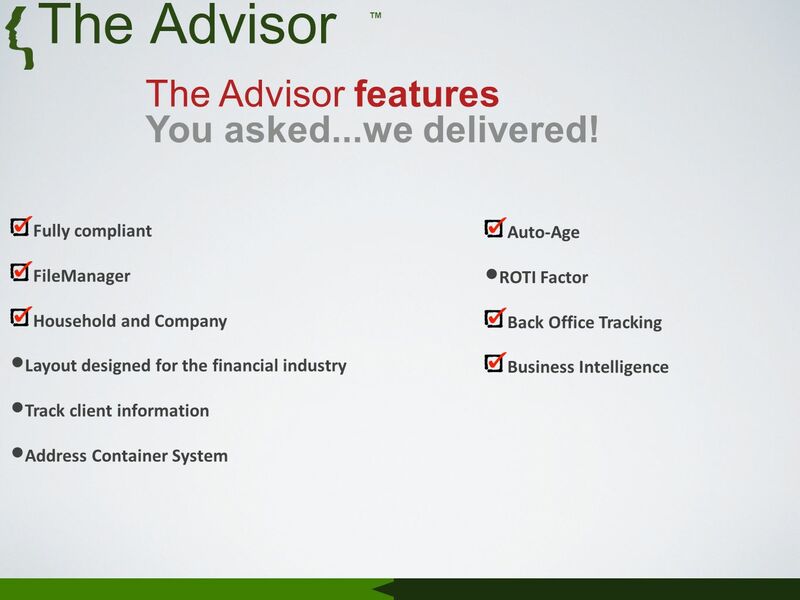 THE ADVISOR has been developed over 15 years and is the most sophisticated and powerful offering connected to the Sage ACT! CRM system. 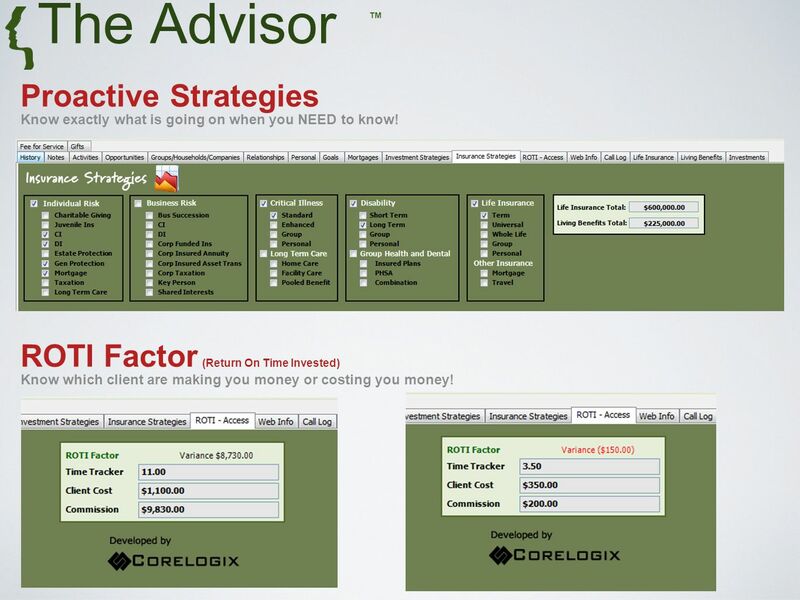 6 The Advisor Proactive Strategies Know exactly what is going on when you NEED to know! ROTI Factor (Return On Time Invested) Know which client are making you money or costing you money! 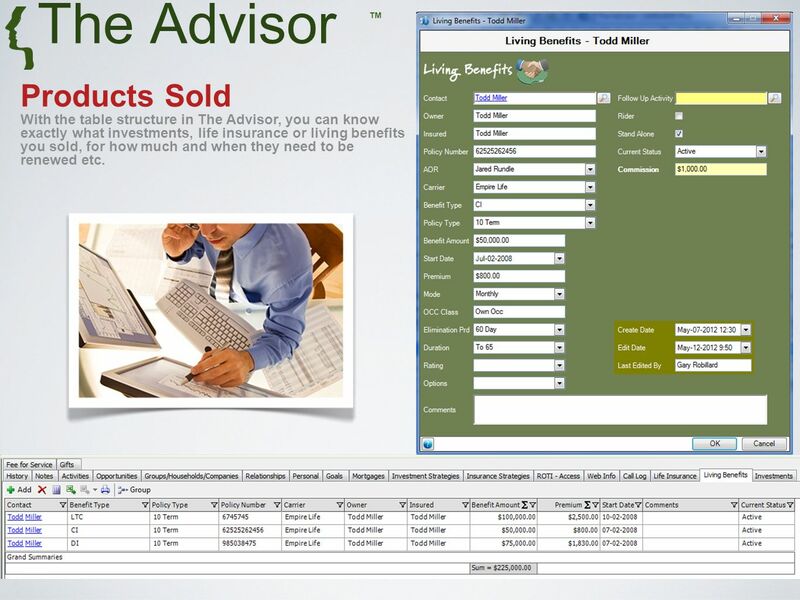 7 The Advisor Products Sold With the table structure in The Advisor, you can know exactly what investments, life insurance or living benefits you sold, for how much and when they need to be renewed etc. 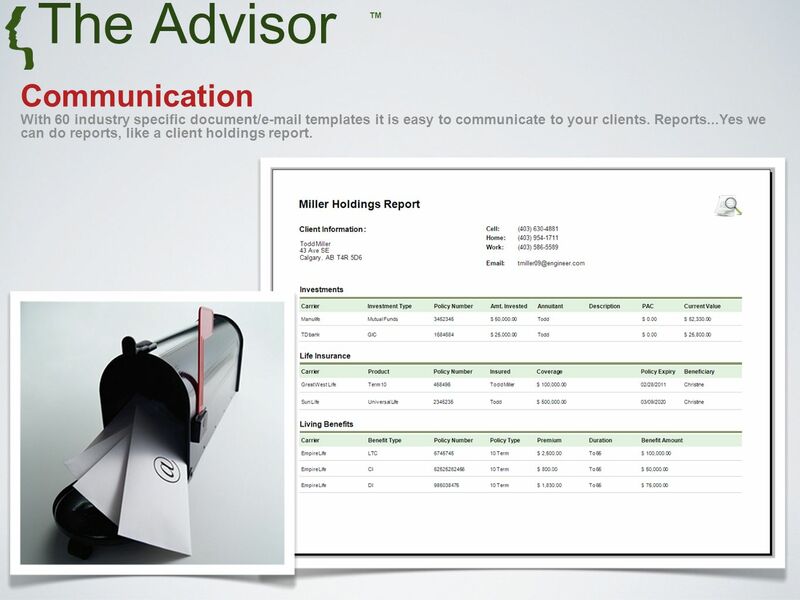 8 The Advisor Communication With 60 industry specific document/e-mail templates it is easy to communicate to your clients. Reports...Yes we can do reports, like a client holdings report. 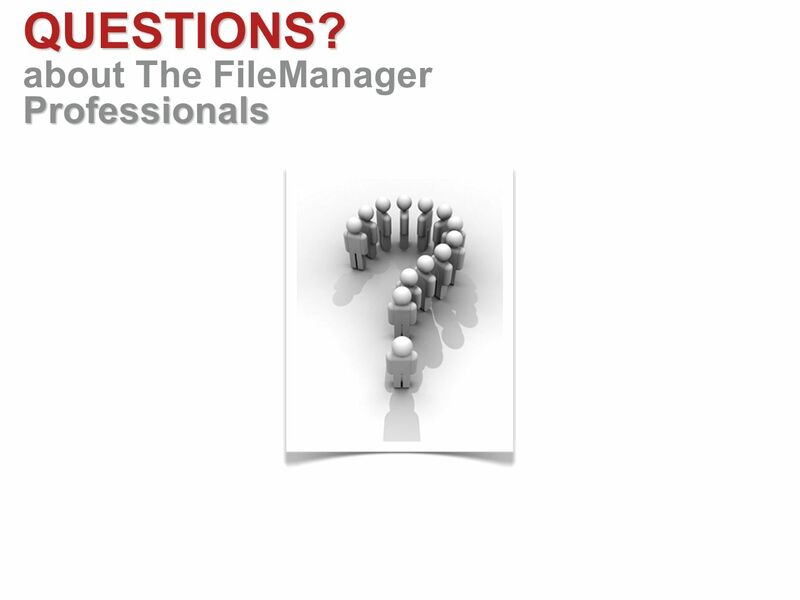 12 FileManager THE The Easiest File & Document Management System Made for ACT! 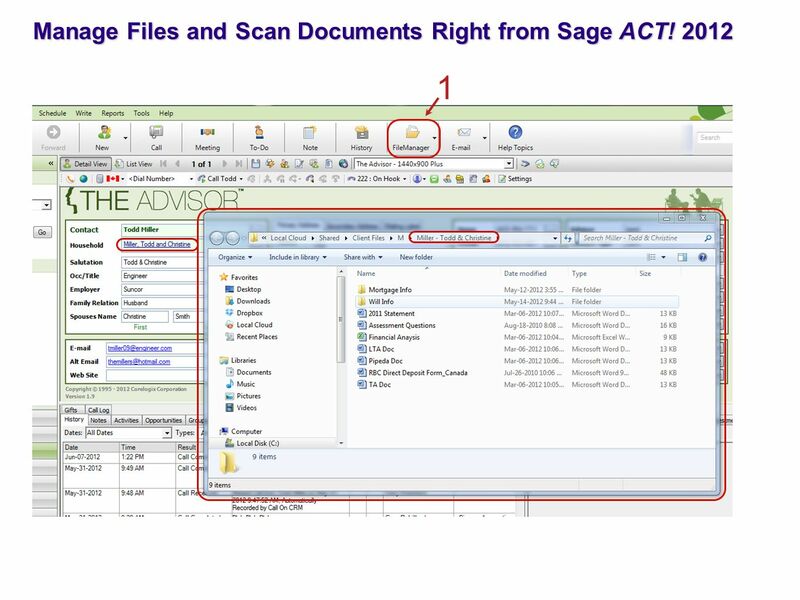 Click here to select the location to store existing client files or click here to open existing client folder. 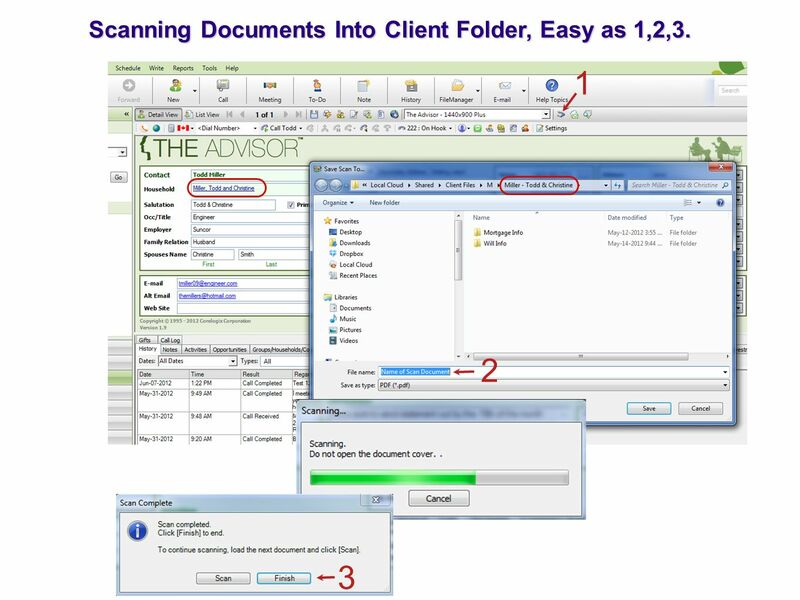 Click here to scan a document directly into existing client folder. 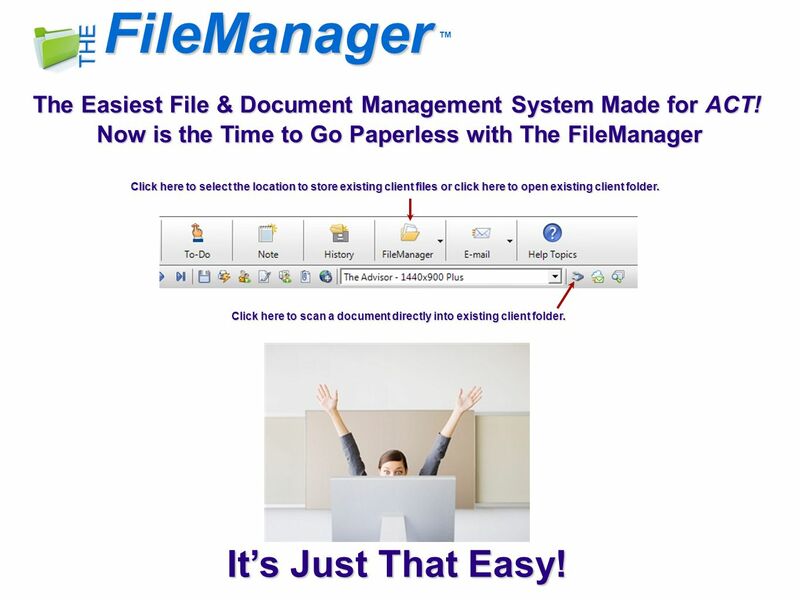 Now is the Time to Go Paperless with The FileManager Its Just That Easy! 14 11 1 2 3 Scanning Documents Into Client Folder, Easy as 1,2,3. 16 Contact us... Gary Robillard - Corelogix Corporation gary@corelogix.cagary@corelogix.ca (403) 692-8805 Ext. 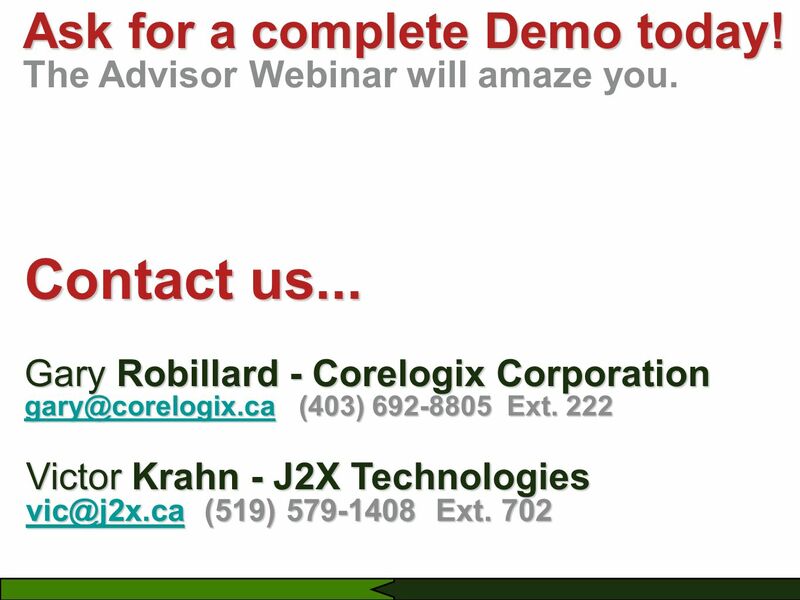 222 gary@corelogix.ca Victor Krahn - J2X Technologies vic@j2x.cavic@j2x.ca (519) 579-1408 Ext. 702 vic@j2x.ca Ask for a complete Demo today! 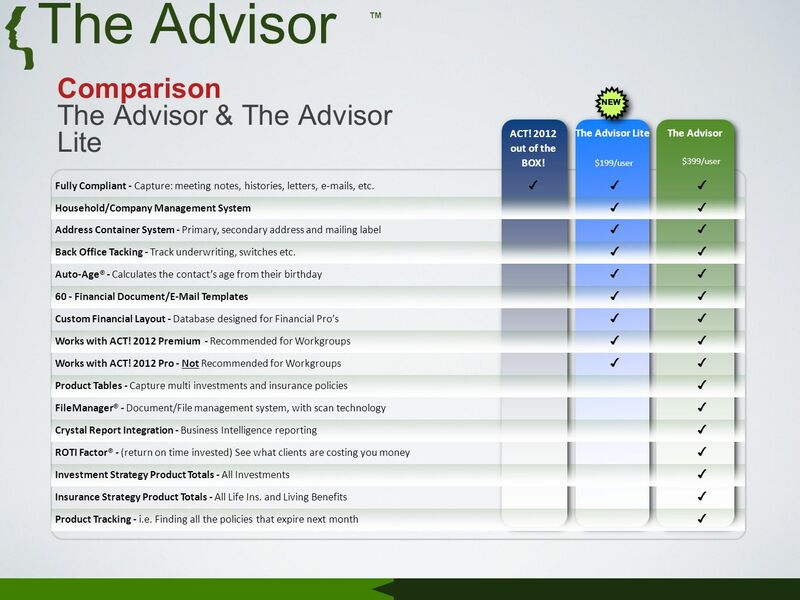 The Advisor Webinar will amaze you. 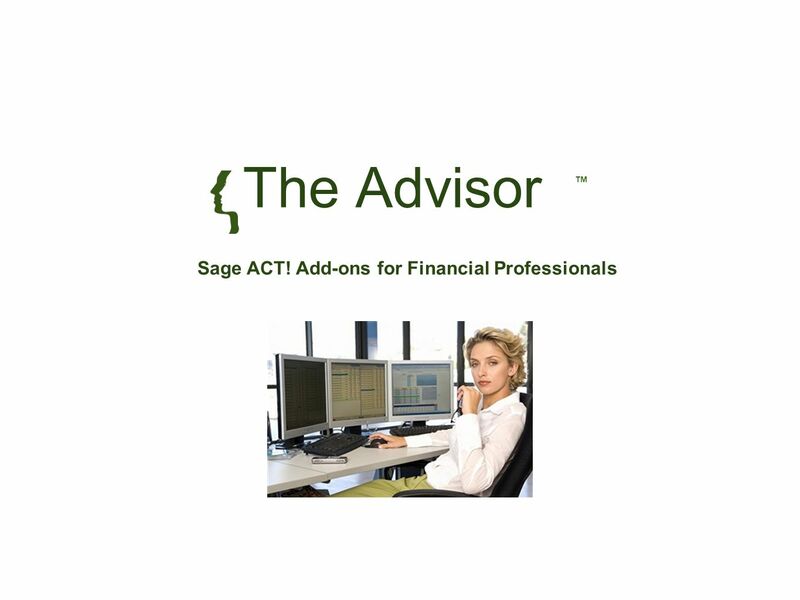 Download ppt "The Advisor Sage ACT! 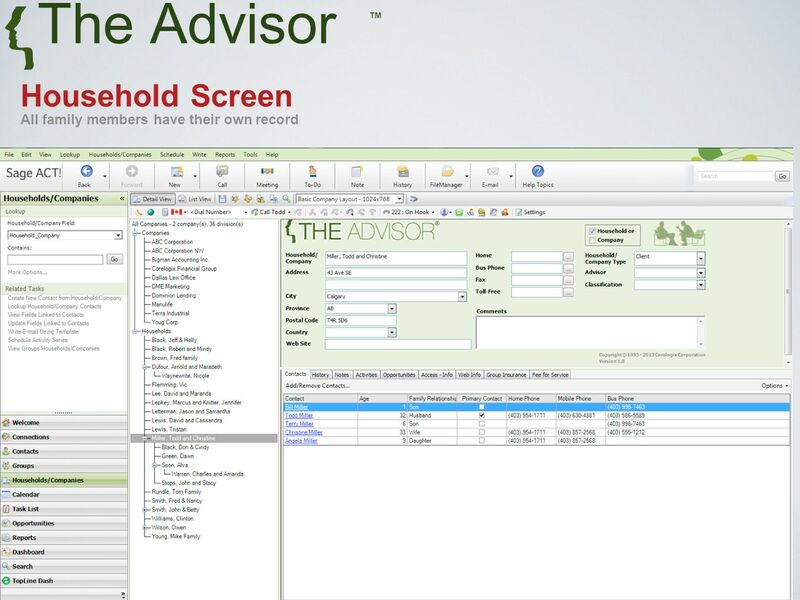 Add-ons for Financial Professionals." Adding attachments to E- mail By Megan Chamley. what are they used for… An attachment is used to add a file like a word document, spreadsheet, photo and. E!Z Work Comp Rater Walk-through Three Part Intro to E!Z Work Comp Rater: 2. Quote Builder 1. Menu at the Top 3. Strategic Use of E!Z Work Comp Rater. 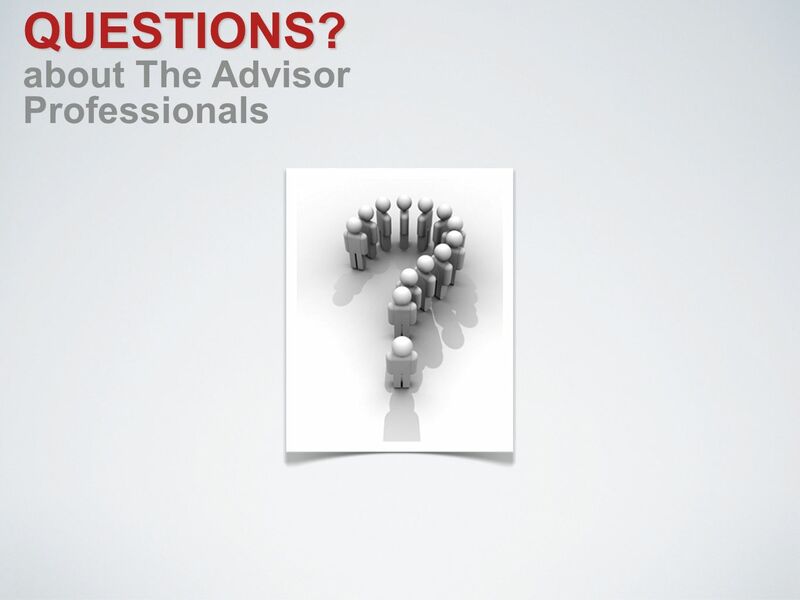 Hold Recommendation Policy and Procedure Part of the KYC and Suitability Rule. BRINGING YOU THE KNOWLEDGE AND TOOLS TO GROW YOUR BUSINESS …your gateway to financial success. Copyright © 2005 ACNielsen a VNU company How do I access scanning data?……. A Product of HR Applicant Tracking System Online HR Solutions for seamless recruiting process management Copyright © ANGLER. Access 2007 Product Review. With its improved interface and interactive design capabilities that do not require deep database knowledge, Microsoft Office. Copyright © 2009 Pearson Education, Inc. Publishing as Prentice Hall. 1 Skills for Success with Microsoft ® Office 2007 PowerPoint Lecture to Accompany.